Last summer when all my friends on Facebook were posting beach pics I was pretty jealous. I even whined blogged about it here. I need to see the ocean every so often, and it has been almost two years. So the first thing we did after our 6 hour car drive and dropping our things in the room was head out to the beach. This is the first time the twins have seen the ocean. They took right to it. A gorgeous day with temps in the mid 60s. And walked. I think this was the furthest the twins have ever walked before. Cort, for once without a paci in his mouth. Reid, like a sheepdog with that hat in his eyes. Oh, I spoke too soon about that paci. 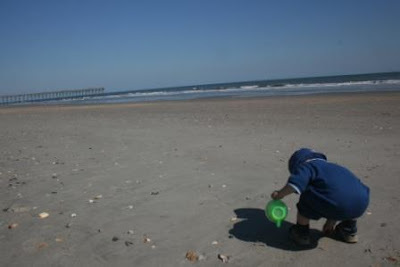 Ocean Isle is a wonderful beach for shell hunting. There are places that are just thick with shells. Ah yes, and now my soul feels rejuvenated. Thank you, ocean. What a gorgeous place! The children look to be having a marvelous time. Will you go back this year? The beach and ocean are my soul soother too. I have never moved far from it, always within a few miles, and my dream is to some day have a little cottage right at the shore. This makes me long for a beach trip! I loved the pictures. 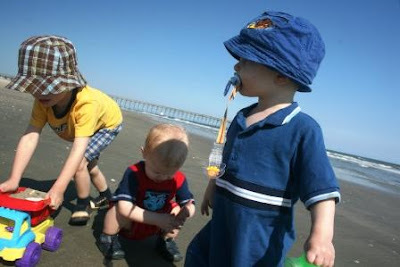 I loved seeing my boys withtheir first ocean visits. 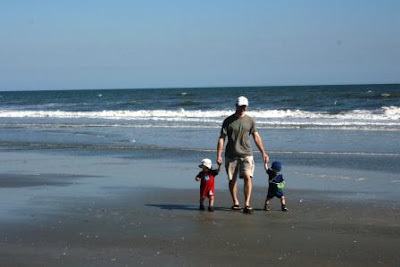 My middle one kept stomping his foot every time a wave rolled up on shore and saying " Back water back"
This year our youngest got to go with us to pick up my sister who lived in Virginia but moved back here. 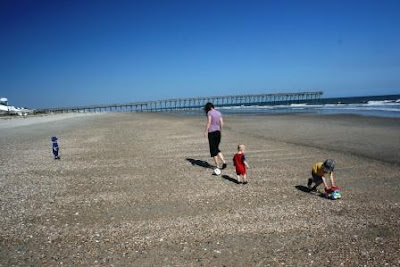 After sending her off we stayed a couple days at my nephews house and took them to the beach. He LOVED IT.. of course the child isn't afraid of anything at all. That's awesome! Glad your family had such a great time. I'm sure your boys slept well after that. We love the beach. Actually you can simply say we are water babies. When not at the beach we love to enjoy our local lake. Driving 6 hours with little ones must be tough, but I'm glad you feel rejuvenated! 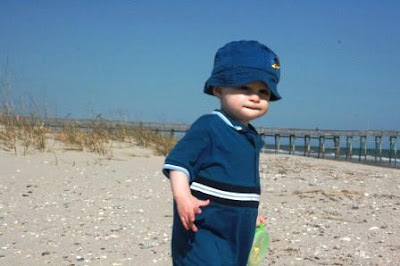 oh my goodness - that pic of cort in that little blue outfit (w/o his pacifier) is just too cute!!! looks like a great time for the whole crew! Love your pictures, and I love the beach too! Amy was about 8 months old when we first took her to the beach-she was delighted by everything-the water on her toes, the feel of the sand. 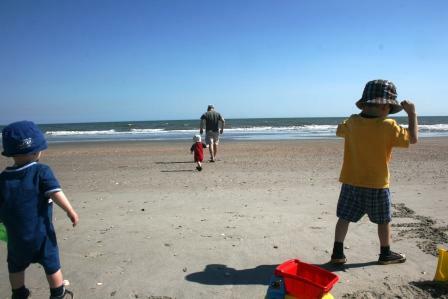 We are about 6 hours from the beach now too, but every so often we have to make the trip-we miss the ocean. I agree with you -the ocean and the sound of the waves do something for the soul. 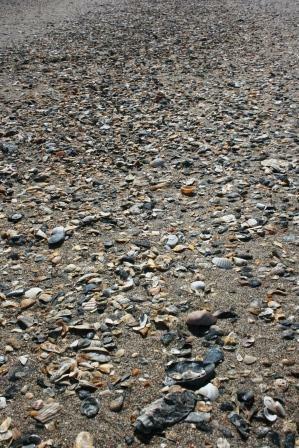 I've never seen so many shells on a beach! The boys were so cute - I bet they were amazed! Adorable. Paci and all. Ohh fuN! I don't even know how long of a drive it would take for us to get to an ocean beach! Great photos. Fantastic Family trip. You can find a lot of sharks teeth in amongst those shells. Thanks for sharing. Wow, I so jealous your boys will wear hats. The second I try to put one on Isla's head she rips it off! When was this? What adorable pictures!! How many shells did you bring home? I have only been to the beach once in my life, when I was a little girl! But my kids and granddaughter go at least once or twice a year, they look forward to it so much. That looks like a wonderful day! 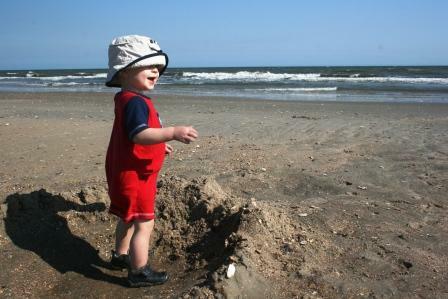 We lived in Pensacola when my son was about that age and we loved beach days! I can't believe all of those shells! My goodness! What a fun time collecting must be! Sounds like a great outing with the boys! I'm glad they liked it so much. Thanks for stopping by. Your boys are beautiful! Some of the best childhood memories involve trips to the beach, looks like you guys are making great ones. 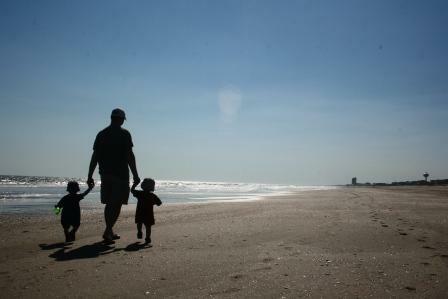 We lived in south Fl., only 7 miles from the beach. I do, at times, miss being able to jaunt right over there! But, after losing our home to Hurricane Frances during the summer of 2004 (and having to endure 3 other Huuicanes that summer! )I am quite happy just to visit the ocean!! Your boys, oh my goodness your boys... they are AHHHDORABLE!! !